If yo are experiencing low water pressure help is at hand in the form of Aqualisa’s Homeboost mains water pump which maintains the incoming supply at 12.5 litres per minute. I can fit this unit for the all in price of £675.00. Low water pressure is a daily source of irritation and inconvenience to millions of people in the UK. The good news is that now, for the first time, an affordable solution to the problem is available. Salamander’s Home Boost is not only inexpensive, it’s also easy to install: it’s compact, quiet and – most importantly – it’s fully compliant with UK water regulations. As all plumbers and heating installers will know, it’s an offence, under The Water Supply (Water Fittings) Regulations 1999’, to connect a pump or a booster drawing more than 12litres per minute to a supply pipe; either directly or indirectly. Home Boost leaps this hurdle, thanks to an integral microchip that ensures that the 12litre legal limit cannot be breached via the pump. The new Home Boost is an intelligent pump; the software built into the unit will recognise that if the mains pressure and flow increases it will automatically reduce its assistance to the incoming mains. It’s a breathtakingly simple solution to a problem that continues to plague possibly tens of thousands of UK homes. Google Analytics reveals, for instance, that the number of searches every month made by UK residents looking for ‘low mains water pressure’ advice and information runs into the 1000’s. Until now, the problem for many has been that the ‘traditional’ low water pressure solution, such as involving the installation of a cold water cistern, (or header tank as it is more commonly known), was both too costly and too inconvenient (largely because of space constraints in households) an exercise even to consider. Home Boost changes all that. 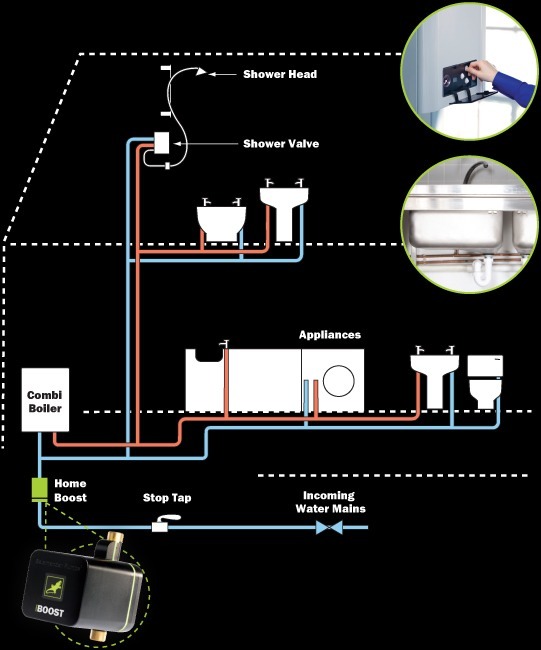 Painstaking research, conducted during almost three years of product development, convinced Salamander’s senior management of Home Boost’s capacity to attract to market a new sector of homeowners, for whom the relatively high cost of the tank installation alternative was prohibitive, forcing them to ‘grin and bear it’ when it comes to poor water pressure and flow. Chris describes the trade’s reaction to Salamander Home Boost as “astonishing and very gratifying.” The Chartered Institute of Plumbing and Heating Engineering, (CIPHE), is the professional body for the UK plumbing and heating industry, and its operations manager, Danny Davis, believes that Home Boost presents the UK plumbing industry with an opportunity. “There are over a million combi-boilers installed each year, and for many installations poor flow can be a problem. A common solution is to replace the incoming mains water supply, which can be laborious and can be cost prohibitive,” he says.